Now playing in theaters is director David Dobkin’s The Judge. Robert Downey Jr. plays an attorney who returns home for his mother’s funeral only to learn that his estranged father (Robert Duvall), a judge who suffers from Alzheimer’s, has been accused of murder. 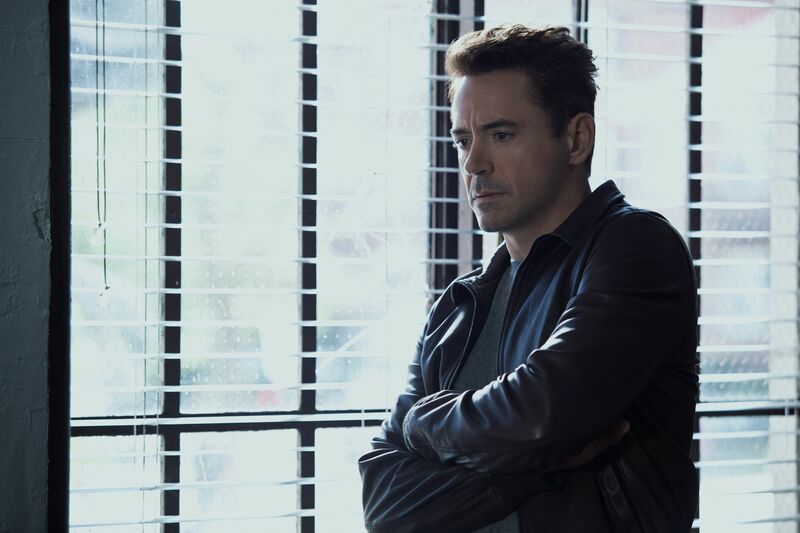 The film marks a departure for Dobkin, who has previously helmed comedies such as Wedding Crashers, Fred Claus and The Change-Up, and it’s also a big debut of sorts for Downey—The Judge is the first film released under his production banner Team Downey, which he runs with his wife and producing partner Susan Downey. 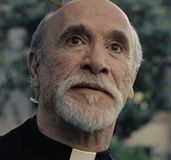 The film also stars also stars Vera Farmiga, Billy Bob Thornton,Vincent D’Onofrio, Jeremy Strong, Dax Shepard, Leighton Meester, Ken Howard, David Krumholtz, Balthazar Getty, and Denis O’Hare. 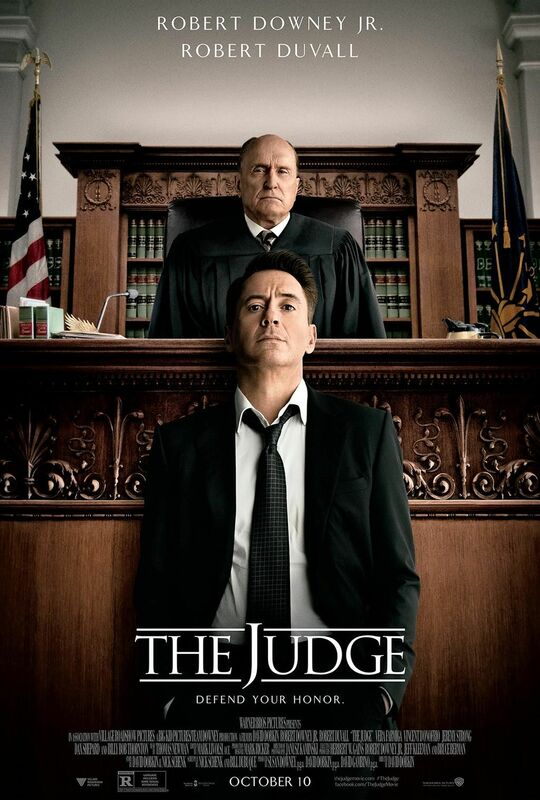 For more on The Judge,watch the trailer or these eight clips. At the recent Los Angeles press day I landed an extended interview with Susan Downey. She talked about developing The Judge and what changed along the way, the first cut, collaborating with Dobkin in the editing room, why they wanted it to be their first project, how the industry has changed since working with Joel Silver, what needs to happen to get Robert and Shane Black (writer/director of Kiss Kiss Bang Bang) working on another project, the status of Sherlock Holmes 3, Team Downey projects Pinnochio, Yucatan (which was based on the late Steve McQueen’s idea for the treasure hunt movie), the Hunter Scott U.S.S. Indianapolis story, a horror movie, and more. Hit the jump for what she had to say. SUSAN DOWNEY: Since then [Sherlock Holmes], we started Team Downey right before we were doing that movie and then it’s been about building up the company. When you’re like me or Robert and you’ve been doing this for a long time, you have this perceived notion that once you start a company, you should immediately be making movies. But between Sherlock and his Marvel commitments, we had some nice ramp up time to put a bunch of things in development—one of which being The Judge. Everyone’s like, “What’s first for Team Downey? 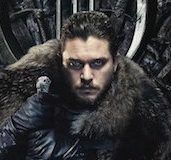 When are you going to do?” And I’m like, “Well, it’s gonna be the first great script that we get.” With some of these really big tentpole movies as you know, they announce release dates, you have a start date whether the script is ready or not. It was really refreshing with this one to not have that pressure on us and kind of be able to develop it with Dobkin over two years before we got a script. When we read the script we were like, “I think I know what the first Team Downey movie’s gonna be.” In the meantime, we’ve also been working on television stuff, so we have a few series set up now. Just really kind of having fun telling hopefully fun, talented driven stories but really accessible, commercial, a variety of genres, that kind of thing. You worked with Joel Silver for a while. Exactly. For you, how has the industry changed from when you worked with Joel back then to what’s going on right now? 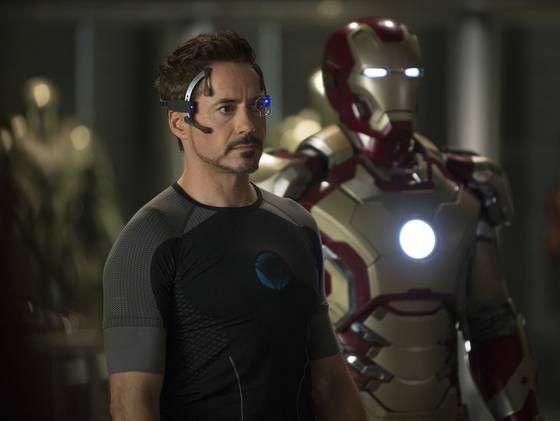 DOWNEY: I’ve definitely noticed a change, certainly in the behind-the-scenes of it. When I started with Joel there was still the reign of the huge producers and the huge studio deals. I think so much of that has been reined in. Warner Bros., where I spent pretty much most of my professional life, they continue to make a lot of movies but so many of the studios are pulling back. What I saw over all that time were so many deals disappearing and producers disappearing, fewer movies getting made, and it just being a bit more difficult. Working with Joel, we were in a bit of a bubble because he was always making things that were working for the studio and that kind of thing. We were always in production on something. As far as what I witnessed out there in the world, it definitely has shifted. But certain things that he focused on and the company focused on are still dominant on the marketplace. Things that are based on pre-existing material, things for that particular demographic, whether they’re based on a YA novel or something else. I see that still happening. The kind of movies that we focus on are still really strong and continue to be. A long way of saying I’ve seen a lot of kind of more systemic and processed changes. Although we still are providing the kind of material you’re still seeing out there now. What do I need to do–and I represent fandom–to get Robert and Shane working more together? DOWNEY: That’s a good question. Well, you saw Iron Man 3, did you like that collaboration? I did. They seem to have some success together. They have a lot of chemistry. So I need to know what I need to do–and I represent a lot of fans. DOWNEY: I understand. I think the appeal needs to be to the two guys. Shane’s a genius in his own strange way and he’s so particular. If you look at his career, the things that he makes, but as a director it’s been a very slow process for him, a very slow trajectory. That’s his design, that’s not for lack of other people wanting to keep him employed. He’s very particular. He’s got a movie that he’s doing now called Nice Guys, which was in development when I was at Silver. I’m very familiar with that project. It’s not too dissimilar to Kiss Kiss, it’s a different time period and obviously different characters and all that. If you liked Kiss Kiss you’re gonna like that movie as well. I’d love to see them collaborate again. Kiss Kiss it’s really–for me and Robert–it’s such a special movie. We got to make it in Los Angeles. We shot–as you can imagine, having seen the movie–so many nights. You’re kind of living in this really weird netherworld as you’re making the movie. I think we had one day of shooting and then the rest were nights. We were sort of only half awake the whole time but we loved it. The other thing that’s interesting about that one is–the dialogue’s so good. It flow off of Robert’s tongue and Val who’s amazing in the movie–it flows off his tongue. There was very little improv, very little. I think that probably surprised people, that was scripted. All those weird things that only Shane’s mind matched with Robert and in this case also Val, just sells it. I think we have to appeal to Shane and to Robert. I’ll get behind you on it. I appreciate it. At least I have half of Team Downey on board. I’m a big fan of Shane and I would just like to see them working together. DOWNEY: I agree. I’m with you on it. I’d love Shane to make more movies, just as a director. As a writer he’s amazing. I’ve told this to Shane as well. 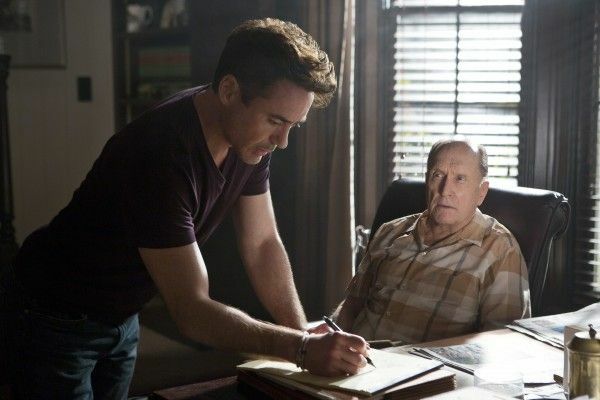 DOWNEY: What does he say? I thought he was going to do Doc Savage, I was pretty sure that was gonna go. I think it came down to budget. I’m happy he’s doing something. Jumping into Judge, from when you started developing it to what people are seeing on screen, how much changed along the way? DOWNEY: I’ll put it this way, there was no C.P. Kennedy, there was no Dwight Dickham, we never went in the courtroom. That was the script I got. The affliction that the judge is suffering from was completely different. So it’s a radical change. DOWNEY: It’s pretty radical. David Dobkin brought me the draft, it was a story that he created kind of based off of something that he experienced in his life. While not being autobiographical, it was definitely informed by that. All the themes and the journey he wanted Hank Palmer to go on were in the original idea. There’s a couple scenes, like the bathroom scene and another couple key moments, again, inspired by Dobkin’s own life, that have always remained in the script. What we love and continue to preserve were those themes of the guy who left and has to return to the small town having to deal with reconciliation, having to deal with skeletons from the past, and having to deal with difficult relationships. Be it, siblings or parents or past loves. All that was always in the DNA of it but as far as the actual plot and what happened that night, and what was the back story? What’s the backstory with the brothers and what’s the backstory of the judge’s case that made him let Blackwell off? All of that was created. Even the dynamic with the brothers—who Dale is, who Glen is, what their personalities are, how they relate to Hank. All of that was us getting together over the course of two years. Whenever we weren’t doing movies, we were in the same town, we’d sit with Dobkin. It was me and Robert, Dobkin, and David Gambino who runs our company. The four of us would sit around and have dinner and we’d talk about what we wanted this movie to be. By the time we got Bill Dubuque who wrote the draft that got the green light, we had a pretty thorough outline that we handed Bill. That said, Bill infused the actual script with so many beautiful details that we could never have imagined. Really fun things too like jury selection, we said, “We don’t need that. It’s gonna end up in the editing floor.” He goes, “I got an idea for it so let me just take a shot.” And we’re like, “Alright.” And sure enough it’s a delightful moment. All this stuff, the relationship with Sam and what happened in the past. Her daughter and the situation there and even this daughter—those all came out of the conversations. I don’t want to say none of that existed in the original. I can’t actually remember all the specific things but knowing what we discussed very well, remember that over the two years, all that came together in the development of it. 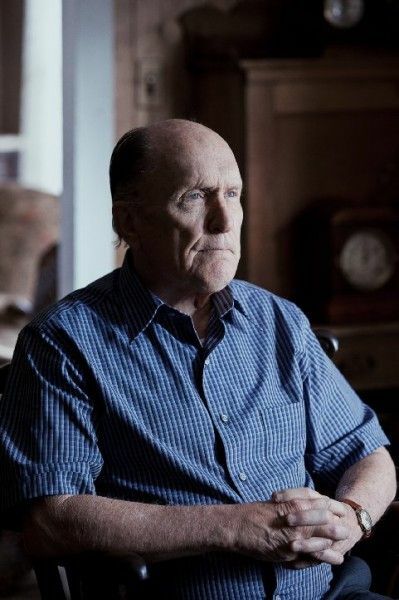 Again, the core and the DNA of what the story was that Dobkin wanted to tell and the journey he wanted Hank on, and the circumstances of mom dying drawing him home, dad faces a situation that brings up the past and has an issue going on that his son now has to come and deal with, was there. 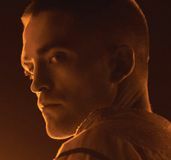 That’s what I thought was really interesting for us as a company, for Robert as an actor to explore. How much are you and Robert involved in the editing room or do you let David handle it and just let you see the cut? DOWNEY: To a certain degree you have to do that because there are guilds and stuff. Dobkin was really generous with the editing room, so he let us in quite early. We had a lot of movie. 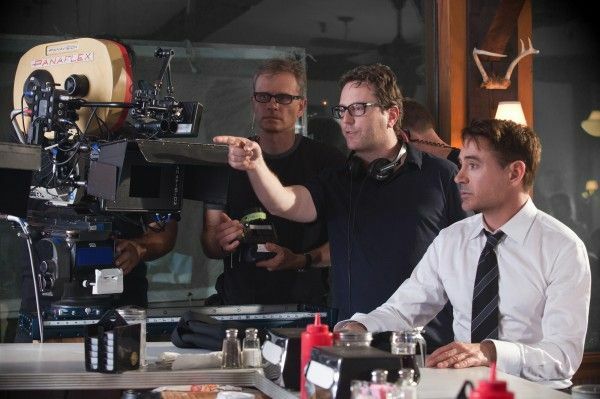 DOWNEY: The first cut he showed us was a reasonable length, it was over two hours but it was really reasonable. He said, “Yeah. That’s not really the first cut.” And we said, “Okay. Bring it on.” It was like almost four hours. There was so much movie there, it was incredible. Bill wrote a beautiful, beautiful script but it was like a novel that we had to then go and adapt—which we kind of joke about. It was pairing it down and saying, “Okay, what’s the story that people really want to follow?” Because there were so many beautiful subplots and other threads, and some of them are still there. But there was even more if you can believe it. 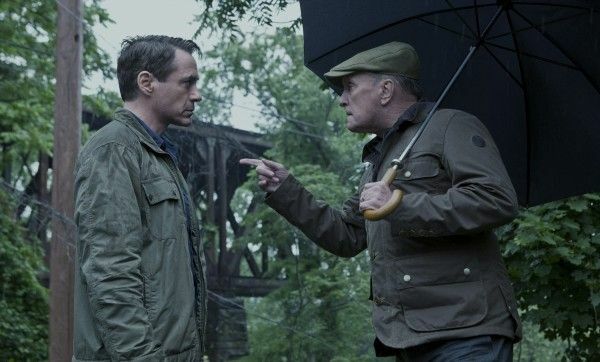 My experience and yet having worked with Joel for all those years and the way he operates, even on the other movies, the few that I did outside of Silver even before Team Downey, I get very involved in the editing part of the process. You have to be respectful to the director, you have to give them the time that they want. That’s a really daunting yet incredibly fun part of the process for me. Then at a certain point, Robert comes in. He doesn’t come in right at the beginning of that. We work for a while and shape it, and then let him see it. What is the status of Sherlock Holmes 3? What do I need to do for that to happen? DOWNEY: [Laughs] I’m curious what other answers you got because I know the truth. It is in development. I heard that and I heard there was even a script or an idea. DOWNEY: There’s an idea. There’s an idea, there’s an outline, there is not a script yet. Trust me, the studio would love there to be a script. But our feeling is, we gotta get it right. When you come back and you do a third one, there’s gotta be something there that really warrants putting it back on the screen again. Other than, “Hey it’s just fun to see these guys together.” Which you know, that’s a really good reason, by the way. The second one with Moriarty and these world stakes and all that stuff, you’re like, “Wow! Where do you go after that?” That’s been the challenge for us. But I think we have an interesting approach that brings back all the things people want to see and love but kind of frames it in a different way, so it doesn’t feel like we’re just repeating ideas or movements that we’ve already made with these guys. Do you realistically see it hitting theaters any time in the next few years? DOWNEY: Yeah. At a certain point it’s going to be too long—we’ve waited too long. We’re working as fast and responsibly as we can to get a great script. As soon as that great script walks in. But we’re working on it. It’s really exciting to hear people like yourself and just fans in general wanting another one. DOWNEY: It’s so good, right? And I think that’s another one where you have a beautiful kind of trifecta because you have he and Jude but you also have Guy. I think they just really bring something kind of magical to the screen that we couldn’t have imagined but we sure hoped for. What do you see coming up for you guys in the immediate future? Do you have a blueprint or ideas of what’s coming up, what Team Downey is going to accomplish in the next year? DOWNEY: To a certain degree. We’ve been spending this kind of ramp up time from the time we started the company to now with a lot of different projects in development. What we aren’t doing is saying, “We have to do this, this and this.” Because the “this, this and this” might not be ready and you don’t want to go and make something that’s not ready. We’ve been playing a lot with television. We have some shows set up and then some new shows that are about to be set up. That’s gonna be kind of a fun thing for us as producers. Can I ask what networks? DOWNEY: Well, we have a first look at Warner, so we have a couple things set up with Warner TV, we have something at Showtime, we have something with MRC. There’s a whole kind of range and we have two things we’re specking out, so once those are done, we’ll probably bring them to Warner first and then somewhere. There’s a whole handful of things. That’ll be a good focus of our time. He probably has to go do another Marvel movie or two. He might have one more up his sleeve. But for Team Downey, we’re super excited. We’re developing Pinocchio for him to be Gepetto. It’s an absolutely beautiful but insane version of Pinnochio that Robert’s working on. We have Yucatan which was based on the late Steve McQueen had an idea for the treasure hunt movie. He wrote these insane leather bound volumes of this beautiful story and we’ve taken that as our launching point to do this great, wild, kind of action, sort of Inception-type of movie. So, we’re working on that right now. We have the Hunter Scott Indianapolis story. We have a whole range. 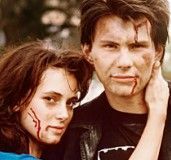 If you can believe it, there’s even a horror movie that Robert had an original idea for that we have a writer working on right now. Kind of like an American Werewolf vibe to it. I don’t think fans are expecting him to be in a horror movie and that would be crazy. DOWNEY: I know. He’s always wanted to do one. Not a slasher movie. The kind that you expect that’s a little bit kind of classier. This one’s certainly gonna have a sense of humor to it. Again, anything we do, no matter what genre—if it’s drama, it has to have wit and humor. If it’s more comedic, it has to have a heavier kind of layer of reality underneath it. We don’t go too broad either side of the spectrum. Those are fun to see but it’s just not. We kind of try to drive them character.